With the presence of a large pool of participants, the global air quality control systems market is displaying a highly competitive business landscape, finds a new research report by Zion Market Research (ZMR). Alstom, Siemens Energy, Burns & McDonnell, Mitsubishi, Babcock & Wilcox Company, ABB Ltd, Foster Wheeler, and Hitachi Power Systems are some of the key vendors of air quality control systems across the world. These players across air quality control systems market are focusing aggressively on innovation, as well as on including advanced technologies in their existing products. Over the coming years, they are also expected to take up partnerships and mergers and acquisitions as their key strategy for business development, states the air quality control systems market study. Reportedly, in August 2018, three free apps, namely, Air Visual, Plume.io, and AirNow were launched by different agencies in the U.S. to monitor air pollution and share air quality data with the authorities. As estimated in this report, the global air quality control systems market stood at US$ 65.49 billion in 2016. 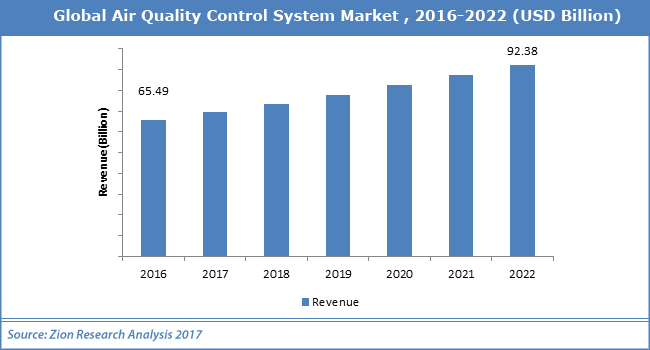 Witnessing a tremendous rise during the period from 2016 to 2022, the revenue in air quality control systems market is expected to reach US$ 92.38 billion by the end of the forecast period. The main systems available in air quality control systems market are electrostatic precipitators, nitrogen oxide control systems, mercury control systems, Flue gas desulphurization, and fabric filters. “Implementation of strict legislations related to nitrogen oxide and mercury emissions in atmosphere are anticipated to spur the demand for air quality control systems in the near future,” says the author of this study. Escalating need for controlling the levels of air pollution in the cement manufacturing, metal processing, power generation, and chemicals is likely to impel the air quality control systems market growth over the coming years. Rising renewable energy trends along with unfavorable economic environment, however, are predicted to impede air quality control systems market progression over the ensuing years. Nevertheless, the industry is forecast to display a robust development in the coming years subject to high awareness among the customers regarding controlling of air pollution and launching of new pollution controlling systems. This will help in normalizing the impact of hindrances on the air quality control systems market, reports the air quality control systems market study. Regionally, Asia Pacific has been leading the worldwide air quality control systems market and is anticipated to continue on the dominant position in the years to come, states the market study. Rapid industrialization in the emerging economies such as India and China is the main factor behind the dominance of the Asia Pacific air quality control systems market. Rapid emergence of coal-fired power generating sector in APAC is another significant factor that is supporting the growth of the air quality control systems market in the region.